Swiss environmentalist Bruno Manser took public action to protest the logging of Borneo and drew worldwide attention to the devastation there. Fifteen years ago, he disappeared and was assumed murdered when his body was never found. This is the story of his compatriot, Mutang Urud, and Radio Free Sarawak, a pirate Internet radio station, still fighting the same war Bruno lost. Radio Free Sarawak has been operating independently and anonymously for years trying to crack the roots of Malaysia’s environmental corruption. One man seems to sit at the hub – a government minister named Taib Bin Mahmoud. When a whistleblower leaks leads that could crack Taib’s web of money laundering just as the government announces an environmentally disastrous mega-dam, Radio Free Sarawak and Mutang find subterfuge and death knocking at their door once again. Together, they face a dangerous path to truth and justice in this thrilling documentary. 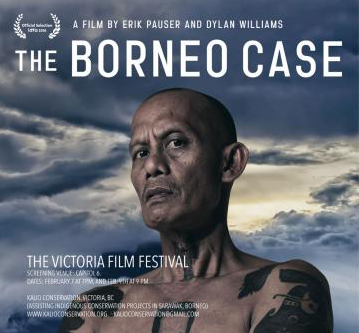 From the very first frames of The Borneo Case, this is clearly not your average environmental documentary. It’s not just about the scale of logging in Malaysia, which has now lost over 90% of its rainforest. It’s about the very real and dire consequences of taking rampant political corruption head-on.